Back in March I added the expenses to the monthly report and I was quite surprised about how low they are. April has been intense: first, I came back from the digital nomad experience in Thailand and went through the re-adaptation phase in Amsterdam. So let me share how April went. Patt Flynn mentioned in one of his long blog posts this free service, HelloBar, that adds a nice call to action bar on top of the web pages and keeps track of the click performances. It means “More than 270 projects in PDF format, Download Now”. The conversion rate was 1.1%, meaning that 1.1% of visitors were clicking on the link and going to the sale page of the product. It means “More than 270 projects in PDF format, promotion for $9.95! Download Now”. This message has much lower conversion rate: 0.4%, obviously because it states already the price so only interested people will click. I run those two messages for a big part of last month before drawing conclusions. Unfortunately with Hello Bar is not possible to track which message ended up in more sales, but I feel better with my users to leave only the second message avoid making them think that the download is free and then get disappointed. I sold a total of 3 products last month, that is not much but I know they came from the introduction of the Hello Bar! In May my domain SalsaWalkAbout.com will expire. This domain was dedicated to the travel blog I wrote in 2011 during my trip to Panama and Colombia. Nice project, but I felt that keeping the blog running for 100 unique visitors a month wasn’t really appealing. So I tested what happens merging two blogs, copying the posts from SalsaWalkAbout into my own blog, the one you’re (hopefully) reading now. Recreate the post on the new blog, copy/pasting the text content and re-uploading the images if necessary. In my case wasn’t necessary because I’m not hosting the images on WordPress itself, but on Picasa (now Google Plus photo albums or something like that). That made the operation super simple. Add a redirection from the old URL of the post to the new one. It’s fundamental that it’s a “301 Permanent Redirection” , because this is the type of redirection message that tells the search engines “hey, we moved the content to this new URL forever, please update the search result!”. I use for this the WordPress plugin Redirection, that also shows the hits to the redirected URL and reports the 404 error messages (page not found). 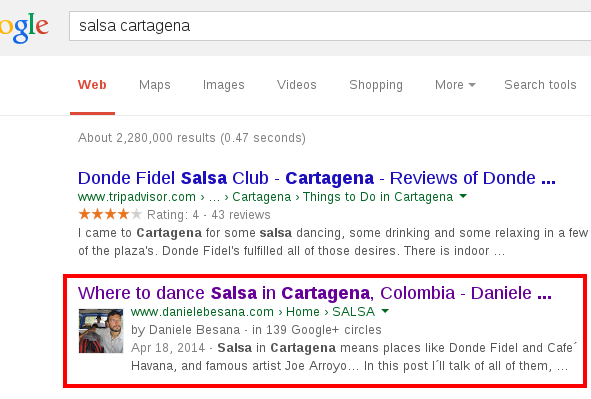 What happened was quite cool: in 24h time Google updated the SERP to the new URL without affecting the ranking! Few days after the moved posts were actually ranking better, I think because this blog has more authority and posts that the previous one. I was showing the ads on posts older than a week, to avoid bothering with ads the few people that check the articles when they are just published, because I notify them by email or social media. My guess is that having ads on a personal blog gives a very different feeling to new visitors. I know I’m not the average user, but myself I notice if a blogger is trying to make few bucks with ads and it would affect my trust. Bloody subconscious! So, screw Adsense on this blog. This month I’ll do the reverse test and double-check the results. Note: some links to products and services may have affiliation. This means that if you’ll buy I’ll get a commission. Never the less, I’m only mentioning here services that I use myself to operate my websites. March was the best month so far in my online career, and April was one of the worst. I’m worried about my job websites. The Spanish ones had a drop of traffic due to changes outside of my control, while AidBoard needs more attentions because at the moment traffic is good but the service sales are not going well. The lesson from April is that it’s really hard to grow an online business alone. In the last months with ups and downs the income from my websites didn’t grow. I can grow the traffic and do all the technical stuff, but marketing and business wise I have a long way to go! So, I’m actively looking for a business partner with extensive experience in internet marketing, do you know anyone? I’m not looking for someone that just read “how to make money online” and had plenty of ideas…. I really need someone with an history in internet marketing.